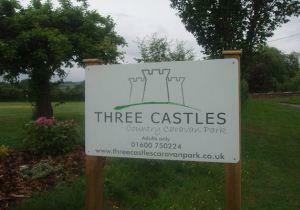 Three Castles Caravan Park01600 750224work Touring & Camping ParkSet in beautiful country one mile from Skenfrith village. Site edged by stream. Ideally situated for exploring the Wye Valley & Vale of Usk/Brecon Beacons National Park/Black Mountains/Golden Valley/Royal Forest of Dean. Easy access site. All pitches have electric/TV hook-up points. Six pitches fully serviced with electric/water/drainage. Communal room – tourist information/selection of reading books. Washing up room – two deep sinks, microwave, small freezer available for ice packs etc. Dogs very welcome, there is a dog walking area and dog wash facilities available. Set in beautiful country one mile from Skenfrith village. Site edged by stream. Ideally situated for exploring the Wye Valley & Vale of Usk/Brecon Beacons National Park/Black Mountains/Golden Valley/Royal Forest of Dean.